In the race to maximize space, packagers are finding answers from above. Above the production areas, that is. In greater numbers, they are using ceiling space for overhead conveyors. Last year, Pacline Corporation, a supplier of such technology, installed more than 125 units with the average order being several hundred feet in length. The ‘lion’s shares’of those orders were to Ontario firms striving to achieve cost-effective operations. Costly expansion plans definitely did not fit into that scenario/ Finding new opportunities to keep product prices competitive certainly did. “We lucked into a real opportunity,” recalls Ross Powell, a member of the industrial engineering department, from his Montreal office at MacMillan Bathurst Inc., manufacturers of corrugated containers. Powell explains that his unit had been using a vacated office area to store printing dies. The possibility of sub-letting that area arose, but it meant finding a new home for the dies. Their solution: suspending the dies from the ceiling using an overhead conveyor. As a result, floor space could still be used for other matters, and access to the dies would be relatively easy. It’s been more than a year since the Montreal facility purchased two overhead conveying lines from Pacline. Each line is 250 ft long and has 10 hangers/ft. Powell points out that this new arrangement saves workers the bother of walking aisle after aisle in search of the die they are after. Instead, each die is given a number and by calling up that specific number, the die automatically comes to the worker. Furthermore, this system makes inventory much simpler. If a die is sent out, an internal envelope is placed in the spot where the die has been located. By consulting the envelope, a worker can find out how long the die has been gone and approach a customer of a company to learn when the die will be returned. “It saves on paper work,” Ron adds. Jim Popowich, Canadian Forest Products Ltd.’s senior industrial engineer for southwestern Ontario says his company uses overhead conveyors in at least six facilities across the country, including the one his is stationed in at London. He adds that overhead systems allow printing dies to maintain their shape much better, and this also improves the life of the die. There are other advantages being realized. “With an overhead conveyor, you eliminate having a product or a package causing congestion in the production area,” explains Al Smith, product manager at Lily Cups Inc., an east end Toronto producer of paper cups. 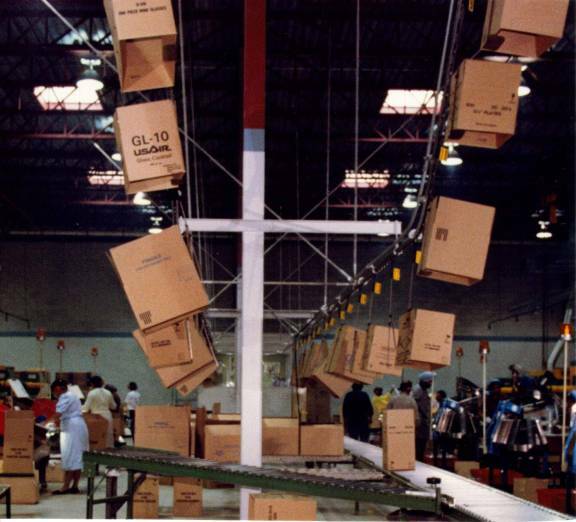 Rather than having empty packaging cartoons of various sizes scattered on the floor, the company installed an overhead system in which the cartons were carried by hooks from the warehouse. Whenever packers needed a carton, they would wait until the size they required came by. At the most, their wait would be a minute. Smith says installing the PAC-LINE™ overhead conveyor, about 1,000 ft long, proved to be an excellent trade-off. It opened up space so that new equipment could be installed. Moreover, it provided a safer mode for transporting cartons. Forklift trucks were needed less, and compensation costs dropped considerably. Pacline systems feature a universal-link conveyor chain that travels inside a round conveyor track. It’s flexibility enables it to convey through tight radius curves on horizontal and vertical plane. Loads can be transported in the conventional way, as a hanging load, or the system can be inverted to convey loads carrying trays. Pendants are standard on 6-in. centers. A pair of vertical precision ball-bearing wheels are on each pendant to carry the load. Between each pendant, a horizontal precision ball-bearing wheel guides the chain around curves. High-tensile strength alloy steel is heat-treated and zinc-plated for full protection from wear as well as resistance to corrosive environments. This PAC-LINE™ overhead conveyor series chain is designed for medium-capacity loads up to 50 lb per pendant. By coupling two pendants with a load bar, 100 lb loads can be conveyed. Distributed loads up to 30,000 lb can be conveyed on a 600-ft system with only one drive, the conveyor link can be increased proportionally.